Kids Cars, and Cadavers, Spiking It Part II » d out involuntarily when a woman, with blood covered face and hands, ran right into the window inches before his face. He thought it was another of the roaming freaks until she screamed, “Help me! For the love of God, help me!” “Don’t let her in,” Jewels said. “She might be infected. It looks like she’s been bit.” “Hey, I was bit!” Chris yelled. “Both of you calm down,” Spencer’s dad said. “We need to help these-” Before he could finish, a gory mailman missing the bottom of his face stumbled toward the bleeding woman. With another scream, she ran from the car and the mailman followed her. “They really are zombies, huh dad?” “Sure aren’t worth saving, is all I need to know. That and aim for the head. Now Spence, I want you and your sister to stay here and roll down the windows two inches. If anything that can’t talk gets too close, blast it.” Looking over his shoulder, he said, “I won’t mind having one of you adults backing me up.” “I’ll go,” Chris said, while he finished binding his arm with a torn t-shirt. “No,” Jewels said. “You’re wounded. I’ll go.” “Well hurry then. There aren’t too many of those things now,” Chris said. “But that last place was crawling with them. If that many show up, I don’t want to be trapped in a car.” “This won’t take long,” His father said. “You just keep my kids safe. If I get back here and everything goes alright, I’ll let you keep the gun.” “That goes for me too, right?’ Jewels asked, as the pair hurried out of the car. Jewels had a pistol while his father had his rifle. Ignoring her, his father said, “Come on, let’s move.” Before Spencer could even roll down the window a few inches, the two adults had already jogged behind the corner of one of the apartment buildings. Shots rang out moments later. Spencer stared down at the black pistol that rested on his lap. It was cold, heavy. It felt too large when his small hands picked it up. His sister’s words jerked him back to the present. “Oh no. How can that thing be moving?” She gagged, “How can it be alive?” A second later, she puked over the floor of the back seat. The SUV quickly filled with the rancid odor of vomit. But Spencer barely paid attention. Instead his eyes stayed glued to the horrific form that slowly stumbled toward them. Its stomach and most organs had been torn from its shattered ribcage. Intestines and viscera trailed more than twice its body height behind the wild eyed man. Spencer leveled his pistol over the lip of the window. His nine year old mind struggled to process what he saw. “That thing can’t be alive. 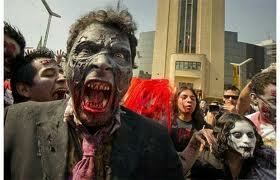 They are zombies.” “Don’t shoot them unless we have too,” Chris said. “We don’t want to draw attention to ourselves. Damn, that stinks.” “Sorry,” Emily whimpered. The disemboweled man’s head jerked in their direction. “Oh crap,” Chris said. “It’s on your side of the car, Spence. Do you think you can take the shot?” “Yeah,” he said and then held his breath while the foul half-man lurched toward their SUV. Balancing the gun in the glass, he took aim. He let out a whoop when his first shot took the zombie right between the eyes. Chris clasped him on the shoulder. “Nice shooting, kid.” He let his hand rest there only for a moment, before continuing. “Their shooting has stopped. I’m hoping that’s a good sign.” Chris slumped back, while Emily made a half-hearted attempt to clean up her mess. A minute passed. More of the zombies were gathering. “I think you were right about the shooting,” Spencer whispered, while sinking down in his seat. “It’s attracting them.” “What’s taking them so long,” Chris hissed. “Just get the girl and run back here, dude.” “Spencer more are walking in from the street,” Emily whispered. Looking back, he saw at least a dozen bulky shapes heading toward them. Most came from the road, but others wavered in from the alley and another from the complex. “Maybe we should hide.” “They have already seen us.” Chris said way too loud. “We need to run while we still can. We can’t get trapped in here!” “My dad told us to stay in the car,” Spencer said. Emily spoke up. “If we leave we’ll have no way to escape, He might not be able to find us.” “Come with me if you want to live,” Chris yelled and then dashed away from the car.” Spencer felt stunned. “He left us. He left us.” Emily stammered. When Spencer saw that the door had been left ajar, he yelled, “Emily the door!” With a shriek, she grabbed the door handle and the door slammed shut. Most of the zombies had lumbered after Chris, but when the door closed, their bloated eyes turned their way and with a loud chorus of moaning, they headed toward the children. To be continued next Saturday. You can discover where Spencer and Emily enter the Eternal Aftermath Here!